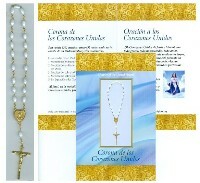 The Chaplet of the United Hearts - White Chaplet with SPANISH prayer card. 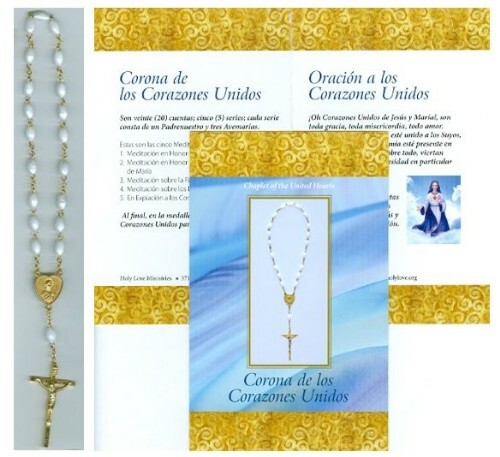 The United Hearts Chaplet with White oval beads and goldtone centerpiece, links and crucifix, packaged with the United Hearts SPANISH bifold Chaplet prayer card explaining how to pray the chaplet. I want you to enkindle in hearts around the world devotion to Our United Hearts. It is purposefully simple to say, but long on meaning. Many favors will be granted through this prayer. The Chaplet of the United Hearts consists of five sets of beads with one Our Father bead and three Hail Mary beads in each set. Meditations are prayed In Honor of The Sacred Heart of Jesus, In Honor of the Immaculate Heart of Mary, Meditating on the Passion of Christ, Meditating on the Sorrows of Mary, In Atonement to the United Hearts of Jesus and Mary. At the end of the five sets, on the medal, a prayer to the United Hearts is prayed for a certain intention. 1) My Son promises He will answer all petitions surrendered to the United Hearts. 2) Through the recitation of the Chaplet of the United Hearts a more fervent reception of the Blessed Sacrament will be made. 3) The United Hearts of Jesus and Mary are a fortress against evil. I have obtained from My Beloved Son a special grace, souls who recite the Chaplet of the Two Hearts (United Hearts) prior to receiving His Real Presence will receive special grace. They will be closer to Jesus. Make it known.